When there is not a safe and easily accessible path between point A and point B a form of crossover is needed. When egress paths are obstructed, crossovers can easily make them unobstructed. When high vehicular traffic areas are not safe for personnel, crossovers can significantly improve safety. When infrastructure or pathways need to be supported between processes or buildings, crossovers are an economical and functional choice. Choose CSI if you are considering Crossovers in Chicago, Illinois, Wisconsin, Indiana, the Mid-West states. We utilize a number of manufacturers whom our client base has standardized on. When they have not standardized on a manufacturer we typically strongly recommend EGA Products as an exceptional manufacturer. CSI provides crossovers to assist personnel in getting up and over equipment or vehicular traffic areas and to support infrastructure and/or passage ways between processes or buildings. Contact CSI for crossovers, your safety and security equipment, and for professional installation. 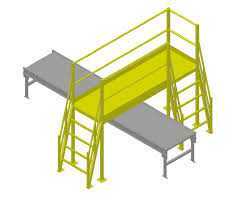 We offer a wide variety of crossovers for all types of purposes, including type of structure, decking, railing, custom designs, designs for specific purposes, seismic, and more. Our objective is to assist you in obtaining your goals and objectives.